Several stems of hydrangea in a vase can take a boring corner of your room and make it look a picture out of a magazine. 1. Cut them so the top of the bloom is just above the rim of the vase. They look quite elegant this way. 2. Use an odd number of hydrangea to achieve the best look. I like using three stems of hydrangea best, because they generally form a nice circle. 3. Pick an unusual color. White and blue hydrangeas are the colors you traditionally see in flower shops. But if you look in gardens you'll see pinks, lavenders and periwinkles too . 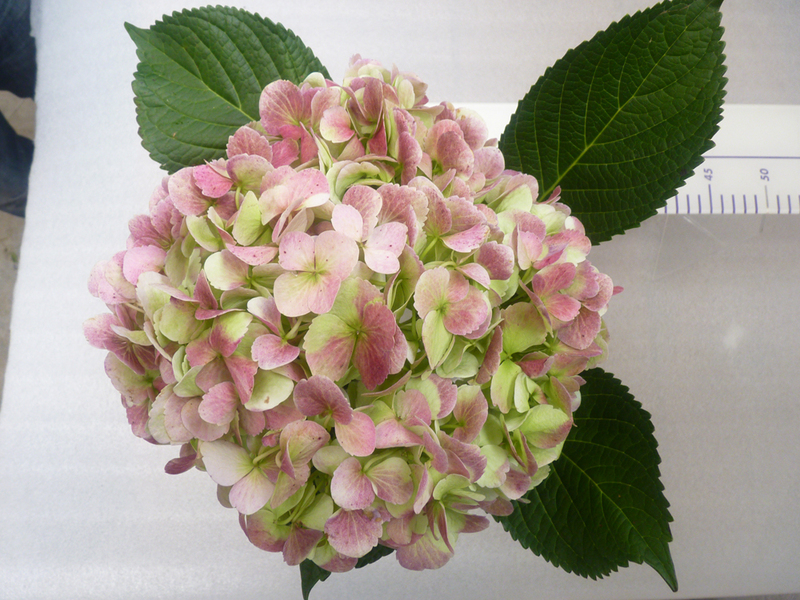 Hydrangeas actually come in several shades of green and in an incredible range of tri-colors. 4. Go big whenever possible. There are some hydrangea from Holland and New Zealand that are just crazy big. They tend to last longer and come in many more colors. Hydrangeas can be a little finicky. Learn how to care for them here. Hydrangeas are just too fabulous -- I should try splurging on a few stems at least once in a while. Thanks for the tips! Hydrangea is one of my favorite flowers be sure to check out the related post that tells you how to care for them. It's always a pleasure to hear from you. Oh, hydrangeas are one of my all time favorite flowers, and that is hard to say because never met a flower I didn't like. I love that we can dry them and keep them. I have tried a number of times to grow them here in Florida, but have unfortunately, had no luck at all.The first year I have them they bloom and it is true bliss, but then the next year nothing or maybe a tiny one.Your blue and lavender ones in these pics just take my breathe away they are so lovely. Thanks so much for sharing them.and I love Monet paintings too. 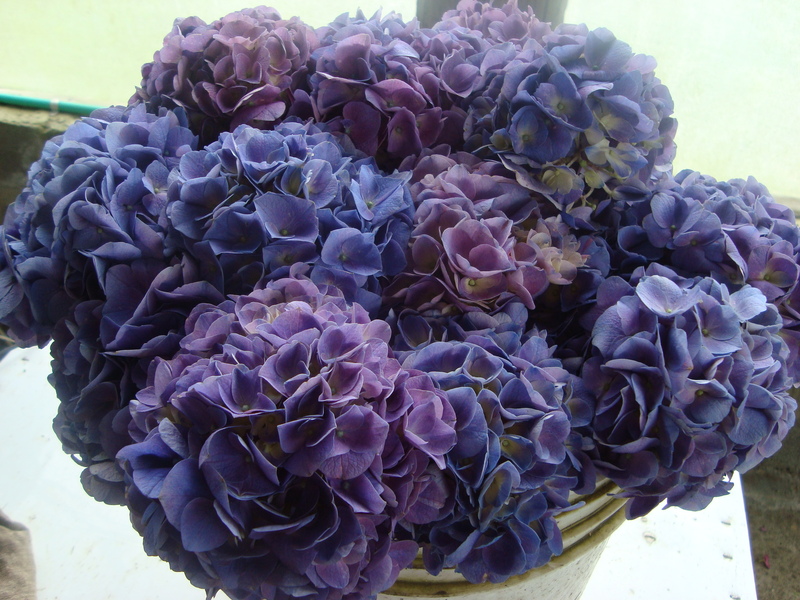 I adore blue hydrangeas. Always have. At my nephew's wedding they had almost a chartreuse color and blue hydrangeas. It was one of the loveliest weddings I have ever seen. Thank you for sharing your beautiful flowers.Mine are all pink! I'm working on turning them blue, but it takes time. Have a lovely weekend. Thanks for sharing your thoughts Jorge. I'll take your pink hydrangeas any day of the week. Juan. Thanks for sharing your thoughts about hydrangeas. These flowers are very heavy drinkers, perhaps that's why you had the problem growing them in Florida.